By Margaret Kellogg on August 14, 2012 Visit Margaret's Website. Going to the Fair is usually a fun event. There are all the wonderful food smells, cotton candy, hotdogs and more. The screams from people having fun on the rides that tickle their tummies. The shouts from the game vendors just waiting to take your money as you try to win the big prize. What a lot of people don’t see or know about is all the efforts going in to the animals that are at the fair, particularly poultry. Raising them, grooming them and presenting them to see if they meet the standards of perfection. There is a lot of tender loving care that goes in to all the animals at the fair. This was my first year of entering a few of my flock. It was both rewarding and educational. The ladies that were superintendents with the 4-H group were welcoming and very helpful to me. Just when you think you know something, you find out you don’t. These women and children were extremely knowledgeable and eager to share that with a newbie like me. There is always room for improvement and growth, not only in yourself but in the birds you are breeding and developing. If you are going to put them on the market, you want to produce the best possible bird you can. Learning the American Standard of Perfection for Poultry is very helpful when you are choosing your birds. I will know what to look for in the future. I learned a lot of dos and don’ts, all of which help me to take better care of my flock. I entered my black, cochin frizzle, Mr. Frizzle. I bathed him on Tuesday and gave him a blow dry so his feathers would have a chance to do their frizzling thing. He took a blue ribbon, but he was the only one in his class. Next year, I hope to have a couple others if I do the fair again. I ordered some specifically to find him a mate this spring from Purely Poultry and so far, I have a couple of white ones and a black one or two. He won’t be alone when they are old enough to put them together. If you put regular cochins with him, they can come out a little frizzly or straight feathered. We have a few peculiar looking rooster running about because the banty cochins were white or red straight feathered. Then I entered Zippy, an Old English Banty who is the sweetest bird you could ever want to have. He had to go in to the Barn yard cross because he didn’t meet the standard for the Old English entry. Who knew that the waddles and combs had to be cropped on this breed in order to show them as Old English. Zippy is too old for that so we showed him in a different class. I am apposed to the cropping feature of the standard, so I will probably not show my Old English in the future unless they are entered as Barn yard cross. He also took a blue ribbon because his competition, one of mine, was disqualified for not having toe nails. Zippy is so sweet and gentle that even young children can handle him with ease. Alexis is only 6 years old. His son Skippy was suppose to be the entry, but ran in to trouble with another rooster so Zippy was the alternate. Skippy has much more color and a fuller tail so that’s why I was going to enter him. He would have had to be entered the same way because I didn’t know about the cropping of the waddles and combs for this fighting breed. The Rooster that did the very best was Elvis, my Polish. I entered him and Splash. Splash is his two year companion hen. I always thought Splash was a Polish as well, until she was disqualified because she was a Mottled Houdan instead of a Polish hen. The difference between a Houdan and a Polish is distinctly their five toes instead of four which most chickens have. Houdans originated in France. It is thought that the Polish or Crèvecœur may have given the Houdan its crest and that a chicken such as the Dorking or other five toed chicken native to France provided the five toed feature. The American Standard of Perfection only recognize the Mottled or White color. However, after realizing I had a different breed of hen than I thought, I have off spring that are a lighter gray and are five toed with V comb that is characteristic of the Houdan. Although these colors are not recognized by the APA they may produce the colors of white and mottled. The hens produce nice sized white eggs. Elvis is a Polish rooster, lovely in every aspect. He received a blue ribbon and also Best Continental breed ribbon. He has a nice crow and hyper disposition as do his off spring sons. They are quite enjoyable to watch and are considered to be an ornamental bird like the Houdan. Obviously, it’s the crest of feathers on their hens that give them a regal appearance and that’s how we chose Elvis as his name. Although there is not suppose to be any white in the crest of a male, because Elvis is almost 3 years old, it is allowed for aging birds. Elvis would be considered blue. After reading the standards to gain better knowledge of what is acceptable and what is not, I have a more distinguishing pallet for the colors of birds I want in my flock for breeding purposes. Beware of hatcheries or feed stores lumping all of these birds in as Polish-that’s how I bought my birds. They are usually sold as straight run Polish unless you get them from a breeder that actually can tell the difference. I bought 3 Polish chicks this spring and can you believe it, every one of them is a rooster. Like a need another rooster. 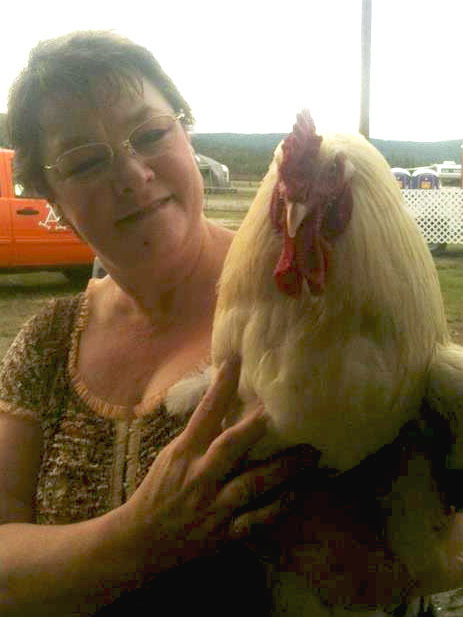 After this fair, I learned that I don’t have any Polish hens nor do I have any real Houdan roosters. My Silkie rooster, Kringle born Dec 24th. 2011. On to the Silkies. I entered a trio of white Silkies. I learned that if you feed white Silkies cracked corn or scratch containing cracked corn, it gives their feathers a yellowing affect and black will get an irridescent green that is undesirable. My rooster had a comb that was large and undesirable. The comb of a Silkie should be a small walnut shaped comb. The smaller less noticeable the better. I heard the judge make the remark that the breeding of my birds was 20 years behind the breeding of the birds that took blue ribbons. Mine took 2nd place. The picture to the left shows Kringle, my Silkie rooster born on Christmas eve. His comb is much larger than it should be. Silkies are one of my favorite breeds. They are very sweet and friendly. The hens make excellent adoptive moms and good hatchers of their own. Recently, a fox got my Cayuga duck hen who had hatched 2 ducklings so I put them in with my black Silkie hen who had a chick and she took them in like they were hers. Last but not least, the boys. Slick, Ralph and Black Beard. These boys probably had the hardest time of all because they are use to free ranging. They are not use to being confine to a cage. Slick is Lt Brahma cross. I thought for sure he would get a blue ribbon but he only got third. He is a beautiful boy and quite sweet. I’m not sure what his mother is, but I’m thinking it may have been a Buff Orpington or Barred Rock because he should have a pea comb but has large comb and waddles and is predominately white. His dad was full Lt Brahma. He really is a beautiful bird. He has a half brother, named Gus who has same dad and black Austrlorp mom because Gus is all black with large comb and waddles and a little bit of rusty color around his neck. Ralph is a Silkie x Americauna. I think he is quite lovely because of his elegant stature and dark features which include those big dark eyes. When the sun hits him, there is purple, turquoise and green that shine through his feathers. He is very pleasant, has a nice crow and received a 2nd place ribbon for young cockerel barn yard cross. Then there is Black Beard. Although I think he is full blooded, I didn’t take any chances and put him in with the barnyard crosses. According to what I have read, Black beard and his father are Araucana. They do not have tails, has ear tufts and beard, with pea comb. But, because I have Easter Eggers in my flock, it is possible that he is an Easter Egger. The confusion between Araucana, Ameraucana and Easter Eggers is that they can all lay blue eggs. Although the Araucana does not have a tail, has a pea comb and disguishing green or willow legs, the Easter Egger can duplicate these traits but is not recognized by the APA nor the ABA. If a trained eye can tell that this is an Easter Egger that has been entered as an Araucana, then it will be disqualified for being the wrong breed on your stall card.